The International Accounting Standards Committee Foundation (IASC Foundation) Constitution mentions about the IASB Framework twice, once in paragraph 29 and another in paragraph 43. Each full time and part time member of the IASB shall agree contractually to act in public interest and to have regard to the IASB Framework (as amended from time to time) in deciding on and revising standards. The International Financial Reporting Interpretation Committee (IFRIC) shall interpret the application of International Accounting Standards (IAS) and International Financial Reporting Standards (IFRS) and provide timely guidance on financial reporting issues not specifically addressed in the IAS’s and the IFRS’s with the context of the IASB Framework and undertake other tasks at the request of the IASB. 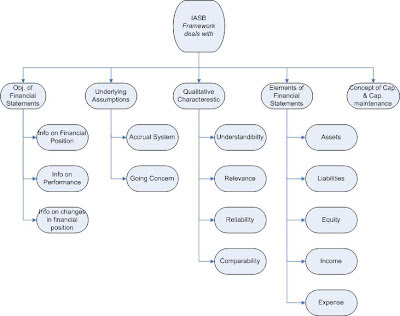 The International Accounting Standards Board Framework or the IASB Framework or the Conceptual Framework is the framework for the preparation and presentation of Financial Statements. The IASB Framework was approved by the IASC Board in April 1989 and adopted by the IASB in April 2001. The purpose of the IASB Framework is to assist and guide the IASB to develop new or revised standards and to assist the preparers of financial statements in applying the standards and dealing with issues that are not specifically addressed by the Standards. The Framework does not have the force of a Standard. Therefore, in case of a conflict between the Standard and the Framework, the Standard will prevail over the Framework. 2. The assumptions on the basis of which the financial statements are prepared. 3. The qualitative characteristics that determine the usefulness of information in financial statements. 5. Concepts of capital and capital maintenance. The balance sheet presents this information. The financial position of an enterprise is affected by the economic resources it controls, its financial structure, its liquidity and solvency, and its capacity to adapt to changes in the environment in which it operates. Performance is the ability of an enterprise to earn a profit on the resources that have been invested in it. Information about the amounts and variability of profits helps in forecasting future cash flows from the enterprise's existing resources and in forecasting potential additional cash flows from additional resources that might be invested in the enterprise. The Framework states that information about performance is primarily provided in an income statement. Changes in the financial position of an entity. Going Concern: The financial statements presume that an enterprise will continue in operation indefinitely or, if that presumption is not valid, disclosure and a different basis of reporting are required. Information should be presented in a way that is readily understandable by users who have a reasonable knowledge of business and economic activities and accounting and who are willing to study the information diligently. (b) Confirming or correcting past evaluations they have made. Materiality is a component of relevance. Information is material if its omission or misstatement could influence the economic decisions of users. Timeliness is another component of relevance. To be useful, information must be provided to users within the time period in which it is most likely to bear on their decisions. Information in financial statements is reliable if it is free from material error and bias and can be depended upon by users to represent events and transactions faithfully. Information is not reliable when it is purposely designed to influence users' decisions in a particular direction. There is sometimes a tradeoff between relevance and reliability - and judgement is required to provide the appropriate balance. Reliability is affected by the use of estimates and by uncertainties associated with items recognized and measured in financial statements. These uncertainties are dealt with, in part, by disclosure and, in part, by exercising prudence in preparing financial statements. Prudence is the inclusion of a degree of caution in the exercise of the judgement needed in making the estimates required under conditions of uncertainty, such that assets or income are not overstated and liabilities or expenses are not understated. However, prudence can only be exercised within the context of the other qualitative characteristics in the Framework, particularly relevance and the faithful representation of transactions in financial statements. Prudence does not justify deliberate overstatement of liabilities or expenses or deliberate understatement of assets or income, because the financial statements would not be neutral and, therefore, not have the quality of reliability. Users must be able to compare the financial statements of an enterprise over time so that they can identify trends in its financial position and performance. Users must also be able to compare the financial statements of different enterprises. Disclosure of accounting policies is essential for comparability. Financial statements portray the financial effects of transactions and other events by grouping them into broad classes according to their economic characteristics. • The item's cost or value can be measured with reliability. Matching principle is a useful concept where it considers whether an asset arises when liability is recognized and vice versa. It is the principle of matching expenses with income. Definition: An asset is a resource controlled by the enterprise as a result of past events and from which future economic benefits are expected to flow to the enterprise. Recognition: An Asset is recognized in the balance sheet when it is probable that the future economic benefits will flow to the enterprise and the asset has a cost or value that can be measured reliably. Definition: A liability is a present obligation of the enterprise arising from past events, the settlement of which is expected to result in an outflow from the enterprise of resources embodying economic benefits. Recognition: A liability is recognized in the balance sheet when it is probable that an outflow of resources embodying economic benefits will result from the settlement of a present obligation and the amount at which the settlement will take place can be measured reliably. Definition: Equity is the residual interest in the assets of the enterprise after deducting all its liabilities. Definition: Income is the increase in economic benefits during the accounting period in the form of inflows or enhancements of assets or decreases of liabilities that result in increases in equity, other than those relating to contributions from equity participants. The definition of income encompasses both revenue and gains. Revenue arises in the course of the ordinary activities of an enterprise and is referred to by a variety of different names including sales, fees, interest, dividends, royalties and rent. Gains represent other items that meet the definition of income and may, or may not, arise in the course of the ordinary activities of an enterprise. Gains represent increases in economic benefits and as such are no different in nature from revenue. Hence, they are not regarded as constituting a separate element in the IASC Framework. Income is recognized in the income statement when an increase in future economic benefits related to an increase in an asset or a decrease of a liability has arisen that can be measured reliably. This means, in effect, that recognition of income occurs simultaneously with the recognition of increases in assets or decreases in liabilities (for example, the net increase in assets arising on a sale of goods or services or the decrease in liabilities arising from the waiver of a debt payable). Definition: Expenses are decreases in economic benefits during the accounting period in the form of outflows or depletions of assets or incurrence of liabilities that result in decreases in equity, other than those relating to distributions to equity participants. Expenses are recognized when a decrease in future economic benefits related to a decrease in an asset or an increase of a liability has arisen that can be measured reliably. This means, in effect, that recognition of expenses occurs simultaneously with the recognition of an increase in liabilities or a decrease in assets (for example, the accrual of employee entitlements or the depreciation of equipment). Measurement involves assigning monetary amounts at which the elements of the financial statements are to be recognized and reported. Historical cost is the measurement basis most commonly used today, but it is usually combined with other measurement bases. The Framework does not include concepts or principles for selecting which measurement basis should be used for particular elements of financial statements or in particular circumstances. However, the qualitative characteristics do provide some guidance. The framework distinguishes between a financial capital and a physical concept of capital. Under Financial Capital maintenance, profit is earned if the financial amount of the net assets at the end of the period exceeds the financial amount at the beginning of that period, after excluding distributions to and contributions from the owners during the period. Under physical capital maintenance concept, a profit is earned if the physical productive capacity (or operating capabilities) of the entity (or the resources or funds needed to achieve that capacity) at the end of the period exceeds the productive capacity at the beginning of that period after excluding any distributions to and contributions from the owners during that period. Conclusion: The above framework is subject to amendment. The IASB along with FASB is working on a Conceptual Framework which is expected to be ready by 2010. 3. IFRS Practical implementation, guide and workbook by Abbas Ali Mirza, Magus Orell, Graham.J.Holt, Second Edition, a John Wiley Publication.